The most important speaker company you've never heard of | What Hi-Fi? 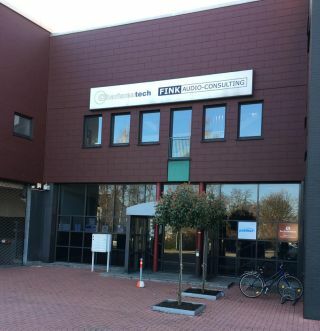 Fink Audio Consulting is one of the most influential and least well-known companies in the global loudspeaker market. It’s an engineering consultancy responsible for some of the finest speakers we’ve heard in the last couple of decades, including multiple Award-winners from the likes of Tannoy, Mission and Q Acoustics. We visited the company’s headquarters in Essen, Germany to shine some light on this, the company you didn't know you knew. Here we met with founder Karl-Heinz Fink and his team. That team is made up of eight people, who specialise in all aspects of speaker design, and for fun play around with hi-fi electronics and headphones too. We listened to a late pre-production version of the newly established Finkteam brand's WM4 floorstanders – mighty £50k+ monsters that aren’t short of finesse either – and got a chance to ask Karl-Heinz a few questions. During my teens I played around with speakers as a hobby – so I was building my own, trying different things out. DIY was very big in Germany at the time and I found myself more influenced by the British speakers of the day than the German ones. KEF was very popular in the DIY market, and I had a chance to meet Raymond Cook, the founder of KEF. I spoke with him for a whole evening and he gave me a lot of ideas about what to do. He was really open and helpful. Later on I started working in the DIY industry. We imported early Harbeth loudspeakers into Germany. They were sold as kits and there was a 6in mid/bass driver you could buy separately. I designed some kits and combinations based on that drive unit. I also met with Ted Jordan, who was a living legend and he influenced me a lot. In the mid-Eighties I worked as a reviewer for a German magazine for a while, and then went to work for my uncle who was running a speaker company. He had a design that was done by a friend of mine – but it wasn’t finished, so my Uncle asked me to help. I did that. It was meant to be for three months but it ended up being three years. We built up a brand called IQ, and in parallel we also started working for Yamaha in Germany. Yamaha became Fink Audio’s first client. Can you tell us some of the brands Fink Audio has done work for? Many companies don’t like to publicise our involvement. We have worked with Q Acoustics right from its beginning; most people know we we did a lot for Mission - pre-IAG ownership - including engineering on the entry-level models and the high end Pilastro. We worked on the current LX range too. It’s not a secret that I worked quite a while for Tannoy, developing the Mercury and Revolution ranges of the late 90s. Other projects we’ve been involved with include the Ovator series and Bentley car systems for Naim, and some Mordaunt Short models after Marantz took over its distribution. We also work for the VW group. Besides developing speaker ranges we also do a number of research projects. Not many speaker companies have the capacity to do research projects, because they’re occupied with working on everyday products. We also have a lot of specialist equipment that they may not have. We have great experience in developing drive units, as well as simulating drive unit and cabinet behaviour. What's your typical process with a client? The first job I have is: understand the company we are working with. Every company has a culture, and the product we produce has to reflect that. What I don’t want is 27 companies that all have the same loudspeakers. They should have an idea of how many models they want in the range - we have the experience to help them make the decision. Then the next thing is the appearance, because there are more loudspeakers on the market with bad sound and good design than the other way around - so good design is absolutely necessary. We can help with that too. In the old days you measured the drive units and made a cabinet of a suitable volume for them to work. Today we do the cabinets first and then develop the drive units to partner them. Next you have to find an OEM manufacturer to build the speakers. Most speaker brands don’t have the facilities to make these things themselves – we have a network in Asia, and someone working there for us to go and visit potential OEM partners. Best drivers in good cabinet or other way around? The ideal thing would be the best drivers in the best cabinet! Given that choice, I would say in my experience good drivers in the best cabinet is the way to go. As long as you don’t use cheap, poorly engineered units it’s really difficult to get bad drivers nowadays. Someone with skill in crossovers can usually get a decent sound. The distortions and disturbances you get from the cabinet are relatively big, and much harder to deal with. I’ve recently changed my mind. If you had asked me six months ago I would have said single wiring was better. I still believe it’s the best choice for speakers up to the middle-market price class. One good cable is better than two not-so-good cables. At the higher end, biwiring makes sense. We can now measure the effect. For ultimate performance would you have a passive speaker or active? If I were to go for the perfect speakers and I had the time to develop them properly I would go active. I can use DSP to correct all the group delay distortions, something I can’t do in a passive design. Digital signal processing – good for speakers or not? Yes. In the automotive market we tune cars with DSP every day. We have a guy who works with different algorithms, so we listen and develop. There are no problems with DSP if done properly. Can a single driver design work well? Yes. It’s not a secret that we have been involved with BMRs. BMRs are single drivers - I’ve made a small monitor for myself using a 5in BMR and it works extremely well. Most modern Bluetooth speakers use a single full-range driver with a subwoofer. But for conventional hi-fi speakers I think we’ll stick with multi-way. What do you think of room-correction software? I’m not a big fan of room correction software. A bad room with some dips and peaks and nodes will still be a bad room. You only have the chance to change things in the area where you are sitting, and fundamentally that doesn’t solve the issue. People may not like hearing it, but investing something in good room acoustics makes a lot more sense. What trends do you see in speaker design? The super-slim speakers have gone. Thank God! Active and powered speakers will become more popular in the future. Most people just want something that works without fuss. People are less interested in fiddling around. That’s why someone like Sonos has had so much success. In 20 years we'll still be using the same principles we have today. But the speaker will be flat, or integrated into a wall, and it will be active. Many just people don’t want speakers that are visible. Voice activation could play a part too.